Pituitary surgery, skull base surgery, meningioma surgery, minimally invasive intracranial surgery, and neurosurgical resident education. Minimally invasive intracranial surgery, neurosurgical resident education. 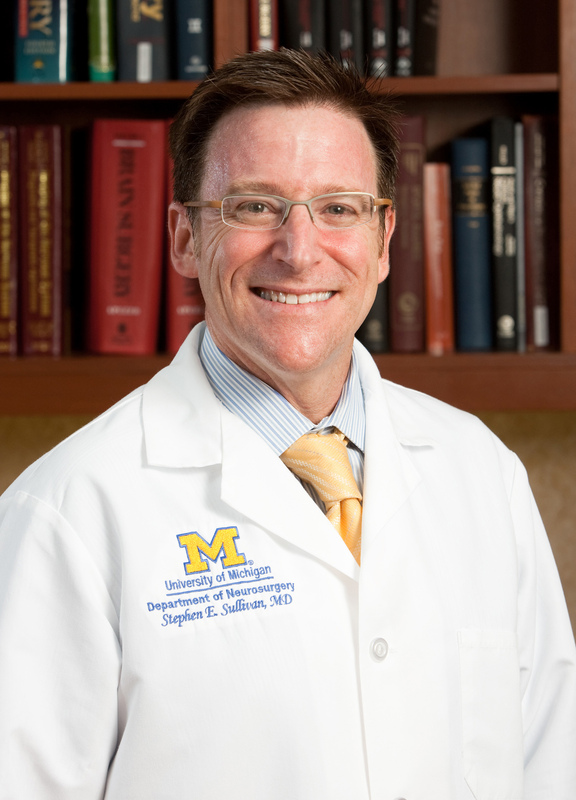 Stephen Sullivan M.D. was raised near Phoenix, Arizona and received his M.D. degree from the University of Chicago, Pritzker School of Medicine. He completed residencies in both Neurology and Neurosurgery at the University of Michigan and is board certified in both disciplines. Dr. Sullivan is the director of Minimally Invasive Neurosurgery in the Department of Neurosurgery and co-director of the Minimally Invasive Skull Base Program based in the Departments of Otolaryngology and Neurosurgery. He is co-director, along with Dr. William Chandler, in the University of Michigan Pituitary Clinic. He holds joint appointments in the departments of Neurosurgery, Otolaryngology, and Neurology. His special interests include the use of advanced endoscopic and computer navigational techniques in the treatment of brain, pituitary, skull base, and spinal tumors. His research interests include the treatment of meningiomas and chordomas of the skull base and spine. He is a recognized specialist in the treatment of patients with von Hippel-Lindau disease. He enjoys history, economics, fitness, and spending time with his family.